Organic materials require composting to produce a form of beneficial end product known as compost. While composting may happen naturally, intervention by humans will quicken the overall process. There are naturally five methods to compost material, namely turning units, heaps, holding units, soil incorporation, and worm compositing. The contents placed in the container may vary- from organic materials such as leaves to disposables such as food waste. However, the general rule is to cut the materials into smaller pieces and also prevent the smell from permeating your home by adding ammonia to the compound. Selecting a compositing method is important so that you can build an appropriate compost container. Building such a container is an easy process. 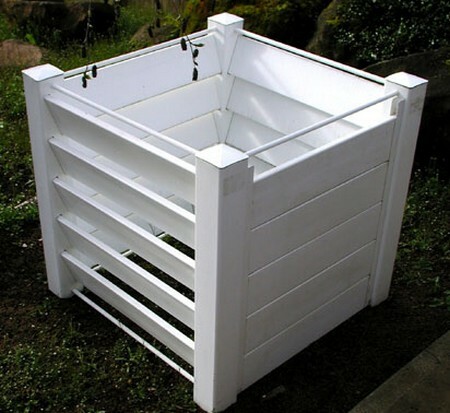 Here are some simple steps on how to build a compost bin. There are different materials that can be used to build the bin. Wood, wire mesh, concrete block or a combination of more than two materials are popular choice among builders. A wire and wood three bin turning unit is most suitable to compost large amounts of garden, yard and kitchen wastes. This is a sturdy structure that will last a long time, though cost of building may be slightly higher compared to others. Some of the basic materials and tools you’ll need include lumber, hardware cloth, galvanized nails, bolts and nuts, hammer, hand saw, tape measure and drill. Firstly, build frames using 2 x 4 lumber by creating a 36-inch by 35-inch “square”. Stretch the pieces of hardware cloth across each frame. Ensure that the corners of the cloth are stapled tightly onto the frame. The wire and wood frames will function as dividers. Next, set two dividers by approximately nine feet apart and parallel to each other. Then, cut a nine-foot piece from the lumber and position two treated boards on top of the dividers. Mark the nine-foot boards on the center of inside divider. Then, drill a half inch hole approximately one inch from the edge. You can now secure (but not tighten) the boards with bolts. Repeat the step by attaching board to the back of top part. Attach a hardware cloth to the back of the bin. Then, create a one inch vertical slot on the inside of each divider by nailing a 34-inch strip to the inside of the divider. Ensure that they are one inch away from the front boards. Insert horizontal slats into the vertical slots, in between the dividers. Last but not least, stain all untreated wood to keep it longer lasting. With these detailed steps on how to build a compost bin, you can certainly build one to recycle your waste and produce compost.